One challenge you run into in ramping up your business’ social media presence is deciding who’s going to do what. A big challenge is not to overload marketing people who already try to do too much and risk dropping the ball on engagement. But on the other hand, marketers don’t want to enlist other, busy people, who they have to manage closely in order to listen, react and share on social media platforms. The biggest risk is that nothing happens and your business goes AWOL after a brief appearance in SM. Out of sight, quickly out of mind. One of the best ways I’ve seen to get around this is to engage employees to connect with your brands’ social media profiles and to encourage them to participate on behalf of the brand. That’s right, a classic case of letting your employees act as brand ambassadors since they’re probably the most authentic spokespeople the brand has. Do you dare to do this? Marketers always seem squeamish when they put employees in the forefront. But, you know, this is marketing’s problem. From a business standpoint, employees are always in front, that’s who people see and talk with. Want to know who does this the best? Look at Zappos. At last count 198 Zappos employees were on Twitter. Check out this article on what they do. It doesn’t stop with Twitter. Your employees should be your Facebook fans and some should even help administer your fan page. Think concentric circles here. Adding your employees helps to add their friends to your fan base, and their friends and, well, you get the idea. It’s a lot more interesting for friends of employees to share their friends’ stories than yours, in many cases. It’s the same thing with LinkedIn. Yes, some of your employees use LinkedIn to look for new jobs, even while they’re working for you. They’re not stupid, thank God. Encourage your employees to create LinkedIn profiles, then create your company group and let them engage each other and share questions and problems on it. Sounds easy, right? It isn’t. The leadership and the marketing leadership at your company need to let people know this is okay, that you encourage it, and that there might even be some reward in it. Then do it yourself, personally, and keep reminding people around you. Read that last sentence again. Do it yourself and keep reminding people around you. I’ve seen too many leaders talk about the importance of relationships and collaboration but yet never seem to do it themselves. If, as a leader, you can’t walk the walk, step aside and let someone else lead this. Employees are one of the best social media weapons businesses have. Are you ready to take aim? When I was a kid and we wanted to take a picture of my grandmother, she’d put on her “picture” face, which was rigid and unsmiling, instead of her normal, nice face. We’d laugh afterwards, because she’d always looked terrible in those pictures. We realized if we wanted a good picture of her, we’d have to sneak one. Marketers have the same problem. Social media raises the stakes for marketers and makes it easier for people to sniff out, and turn off, when they sense a hard sell. The marketers’ challenge is to stop speaking to people as if they were your consumers and targets, and to start speaking to people as if you liked them and had an interest in them. I ran into a marketer yesterday who wanted some advice around social media. Personally, he was totally into an endurance sport, and he would travel around to watch and participate in those events. It turns out that his company was about to sponsor this endurance sport and had put together a special offering to promote the sponsorship. The marketer was totally psyched. After telling me about this, with the excitement rising in his voice he wanted to know if he could tell people about this on social media. His suggestion? I stopped him immediately. “Say it on social media in the same way and passion you just told me,” I suggested. He had taken his excitement at telling another person and, instead, put on my grandmother’s picture face. He had stopped talking to me like a person and started talking to me like a sales number. If you write or talk marketing copy, try saying what you’re writing to another person. Now call someone you like and try saying the same thing. If you find that you’re talking to those people in ways you’d never normally talk to them, try again. You can be conversational, convincing and selling at the same time. Especially if you’re talking about people have an interest in. On social media, it's too easy to tune out, so what you say, and how you say it, is important. It's important everywhere, it's just more apparent on social media. So stop talking like a marketer and start talking like a human being. You know a book is good when you finish it and the ideas still resonate in your head for weeks after. I’m still digesting Ignore Everybody and one phrase has grabbed me. The more I think about it, the more I think it’s a great lens to view what’s happening in marketing today. When these ideas threaten the power balance, those in power will push back, hard. Think about this in context of online marketing and the rise of social media. These new ideas threaten the comfortable and predictable marketing system of the last 50 years. There’s a lot of power invested in this. The change is creating dialogue through digital channels to give more power and real influence to consumers (and even employees). The promise of this change is to stop doing something that’s working less well and start doing marketing that has a higher value and authenticity. Who’s going to push back? Who’s power is under siege? Marketing Departments – Marketing departments and the people who staff them will push back for two reasons. The first is that it’s quite comfortable and easy to pass off the brand stewardship and advertising execution to agencies. It means they don’t have to do that work. Social media and dialogue mean they’ll have to be more involved. Where are they going to find the time? The second is that they’ve fallen into standard operating procedure. In Graham Allison’s brilliant book “Essence of Decision” he describes how organizational procedures take on life of their own, despite the work of rational actors. Agencies – Agencies will push back because this change threatens everything about them. Agencies have made great money on production markups and media commissions. They’ve convinced marketing departments that their crack teams can understand and craft brand essences better than anyone. The former is in a state of irreversible decline. The later becomes less and less relevant daily as customer experience and word of mouth show their true power. Many agencies are turning somersaults to reinvent themselves, some by hiring digital gurus and others by buying sharper, smaller shops. While they make cosmetic changes, the agency core, its raison d’etre rarely changes. The question is whether they can compete over the long haul against newer, more agile shops like The Advanced Guard, Undercurrent or the dream team at The Dachis Group. Mainstream Media – When you start looking at all the alarming news about MySpace, Facebook, online perverts etc, you find that most of these are overblown reports and most of them start with the mainstream media. Cynical as I am, I can’t help feeling that this is one of the big pushbacks by one of those groups with the most to lose. If online were “dangerous” who would want to advertise there? It’s too bad because we need mainstream media and its content still has huge value everywhere. Media hasn’t figured out how to make digital as profitable as traditional and while some try to reinvent themselves, not enough do so. If you’re moving into social media and digital, pay attention to who’s pushing you back. You’ll probably notice that they feel that they have something to lose and don’t want things to change for that reason. If you’re in a marketing department or agency, take some time to reflect on this power shift and start strategizing about how this change can seem less threatening and perhaps even beneficial to the person pushing you back. Sometimes I’m a sucker for a new book pitch, especially if there’s a free prize inside. A few weeks ago people started buzzing about Hugh McLeod’s new book “Ignore Everybody” with the sub title “And 39 Other Keys to Creativity.” Not only did Seth Godin blog about it but Hugh also offered a free extra book to the first 500 purchasers. Very Godinesque. I’ve followed Hugh on Twitter (he’s @gapingvoid) and I read his blog. I looked forward to reading this book a lot more than others I’ve bought recently. And this is not because I try to ignore everybody (at least I think I don’t). Hugh has a great story. Ad copywriter turned illustrator/business card comic creator. This is a story about someone who became very good at something unusual and followed his passion. He didn’t quit his day job for it, but he was able to turn this passion into a very new direction for himself. Two things jumped out at me from Ignore Everybody. The first is that when you finally have that idea for what you want to do, the idea that change the way you do things, expect a lot of resistance. According to Ignore Everybody, change ideas alter the power balance in a relationship. And everyone wants to keep his or her power. Think about it: we experience this daily. At work, our bosses and colleagues resist ideas fro all sorts of reasons. When you put it into the framework of power relationships, it makes more sense. Looking back through these lenses, I understand a lot more of some of the things that happened in the past. Hugh also posits that even friends resist change because they fear that the status quo in your friendship will suffer the effects. In fact, most everyone, except you, is probably just fine with the way things are. This book, more than anything else, is a recipe to break your inertia. The other idea Ignore Everybody pushes is the power of sovereignty. When something is yours, you not only care for it more, it also excites other people more. We want more control in our lives. From career to how marketers treat us. The idea of sovereignty is a powerful one and one of the best motivators around. It goes to the core of who we are as people. Hugh MacLeod has a lots of smart thinking and truisms in his book, some practical, like the amount of work you have to do to succeed, some philosophical, like not looking for approval. At the end of the day, Hugh changed his life through his drawings. If you’re trying to figure out how to change yours for the better, Ignore Everybody is a quick read that could give you some insight on how to move yourself. Since I'm receiving an extra copy, I want to share in the goodness. If you're looking to change, have a creative passion you'd like to follow, or just want some good advice on how to be more creative, write something here or send me an email. I'll give my extra copy of Ignore Everybody to whoever has the most compelling reason. A few days ago I found myself in the middle of the Iranian protest against the re-election of President Ahmadinejad. At least virtually. And the experience has left me with great hope for democracy around the globe. As almost everyone knows by now, the Iranian people had a presidential election. The incumbent Ahmedinejad, bane of the West, had a big lead until his challenger, Mousavi, caught fire and began to look like a sure winner. On election, night, however, the government declared Ahmedinejad the winner by a big margin. The opposition cried foul and rose up in protest. Now keep in mind that this is Iran. Protest is risky, if not life threatening. But the Iranians did protest and when the government tried to cut off all conventional means of communications, Iranians found alternative ways to tell their story, this time through Twitter, Facebook, YouTube, Flickr and other social media sites. The first thing I noticed was a topic trending up on Twitter, the phrase IranElection, which I began to follow. Suddenly, I was transported via social media to the University in Teheran, where defiant yet frightened students were sending live Tweets describing how they were under attack. Iranians posted pictures and shaky cell phone videos showing government agents opening fire on public dbemonstrators and it was hard for me not to duck behind my desk. I listened in as they warned other Iranians as to danger spots, worried about injured friends, and plotted about getting out of one part of the city and into the other. And as I watched, listened and read, I forwarded their stories to people I knew, to show how brave and determined they were. Soon, all of this began to have an impact here. People started Tweeting that CNN wasn’t reporting this so CNN pumped up its coverage. Twitter itself canceled a planned maintenance last Monday after getting pressure from Iranian and US Tweeters to not shut off the protesters’ main outlet. When the Iranian government shut off Internet access, people around the world set up new servers for the protesters to communicate through. It has been inspiring to see the democratically deprived people of Iran challenge the ayatollahs’ stranglehold on information and censorship. And thanks to social media, everyone in the world is watching. Even though a change in government won’t magically turn Iran into a US friendly nation or cause them to give up their regional aspirations, I still I hope the Iranians succeed - if only for the sake of democracy. Because I like to think that social media may be doing for today’s democracy what Tom Paine’s printing presses did for Americans in the 1700s: giving people everywhere the power and freedom to challenge those who abuse power. Because this time, the revolution will be tweeted. Microsoft launched Bing recently in order to take up the fight against Google’s dominance. However good Google is, search in general is a fairly sorry solution to finding things online. Imagine walking into a store and asking a salesperson where to find something and they gave you 10 various answers of which only one, maybe, was correct. Personally, I would not want to be that salesperson. The same is true of search. I use search ALL the time. While I get some good results, I feel like I’m never quite getting what I need. Sometimes I don’t get what I need at all. The problem is that the question I’m formulating in my head is never the taxonomy and description that companies use to describe products or services. Even when it relates to information, the search results break down. Here’s a simple example from my life as a yard-taker-care-of-er. I need something to spray my new fruit trees so that bugs don’t eat up all the leaves. I could just go up to Ace Hardware or Home Depot, ask anyone that question, and get a good answer. I’ve tried every variation possible online and I never get a good answer to what product I should buy. It’s amazing that it’s still this hard. I thought with Bing would improve this, but not so. Bing provides categories to narrow down your search. It does, however, allow you to see part of the page you’re going to click on so you, hopefully, don’t waste so much time browsing through page results that don’t work for you. Adding human intelligence doesn’t seem to work very well either; older search engines tried having editorial boards rank things, to little avail. Nope, unless someone develops a chip to embed in our brains that takes our ideas and concepts and translates them into something search engines can understand I think we’re stuck with what we have for a while. Because what we’re really trying to do is to translate concepts into a common language. Without getting into Wittgenstein, that’s a human problem that not even Google can even solve. My answer is to go to the social Web, ask the question, and hope that some one answers. Or better yet, I think I’ll just hop in the car and go to the store and ask. I’m lucky to have the Gardeners Supply outlet store nearby as well.At the very least someone will say, “I don’t know” and point me in the right direction. “Aha!” you think immediately. “More proof of Online’s hype.” It’s interesting how much we see this, to be honest, and while some of this comes from old media defensiveness, I think some of this comes from people who like seeing upstarts get what’s coming to them. The actual study by Mintel, according to the news releases, showed that a lot more people bought something after they heard about it from someone they knew as opposed to a recommendation of a blogger or chat room person. Weirdly enough, people trusted the advice of someone they knew less well, preferring friends and relatives to partners and spouses. I could go on for days about that, but I digress. What sticks in my craw is asking people if they trust the recommendations of a blogger or someone in a chat room and letting that represent Online Recommendations. It’s as if they asked people if they listened to recommendations from their dentist and doctor and considered that to encompass Word of Mouth. If you ask the wrong questions, you can’t get the right answers. Online word of mouth is much more than bloggers and chat rooms (of course, I have no idea what they even mean with chat rooms; it would be good to see more data). Most online recommendations I read come on product pages themselves, like on Amazon.com, or describe different experiences on aggregation sites, like TripAdvisor.com. Neither of these are bloggers or chatters, but I’d be surprised if these recommendations didn’t impact buying decisions more than the online described by Mintel. And I’m not even getting into something like Facebook and other social networks. Are online recommendations the be-all-end-all? Of course not. Will online completely replace offline connections and relationships? I hope not. I can’t ever see that happening. But don’t try to convince me that online impact is minimal using poorly worded surveys to produce dubious results that get sensational headlines. Doesn’t everyone have something better to do? This last week has seen a rash of good news for online advertisers. Sites like the Daily Beast, Digg and Twitter are ramping up alternatives to the sorry state of online display advertising. Hopefully this will move us away from the old media habit of buying impressions toward a place focused on making impressions instead. Since most display advertising has poor creative and predictable placement, it’s easy to ignore. While adding rich media and creative thinking that takes advantage of the technology helps, it might be too little too late. The Daily Beast has now embarked on a path of custom advertising integrated more closely with its content. This sounds pretty exciting, although it would be good to hear how easy and scalable that is. That’s one of the advantages of the current display model: you don’t have to custom build creative for a gazillion different sites. Hmm, maybe companies like Adroit should take note. But the concept is spot on and similar to some ideas we’re testing out as well. I can’t wait to see the first results from these types of ads. Digg is also placing ads into its content stream and letting people vote on whether they think its good advertising or not. Hurray for Digg, finally letting people have a say in this is a good thing. Surprisingly, this may have the affect have making more people pay attention to the ads, even if they stink. While Twitter got a lot of negative Tweets about it’s pay-per-Tweet idea, you’d be hard pressed to make a case that those tweets are going to be worse than many in your current stream. Each of these approaches focus on content in content areas and we’ll see winners emerge who provide the greatest relevancy. At the end of the day, it’s about making impressions with the people who want to talk with you rather than buying impressions to bother people who don’t want to talk with you. One thing we need now is a pricing model that reflects that. I don’t know why I’m still surprised when I get this type of lazy, impersonal marketing, but I am. You’d think with a tough market you’d see a little more imagination and personalization. It’s too bad this person didn’t show up at our social media event this week. This week I found this in my snail mailbox: a letter from a local realtor representing a buyer. Nothing wrong with that. Um, excuse me; you know my name since you already printed out mailing labels on the envelope. Mr. and Mrs. Seller. Wrong and wrong again. 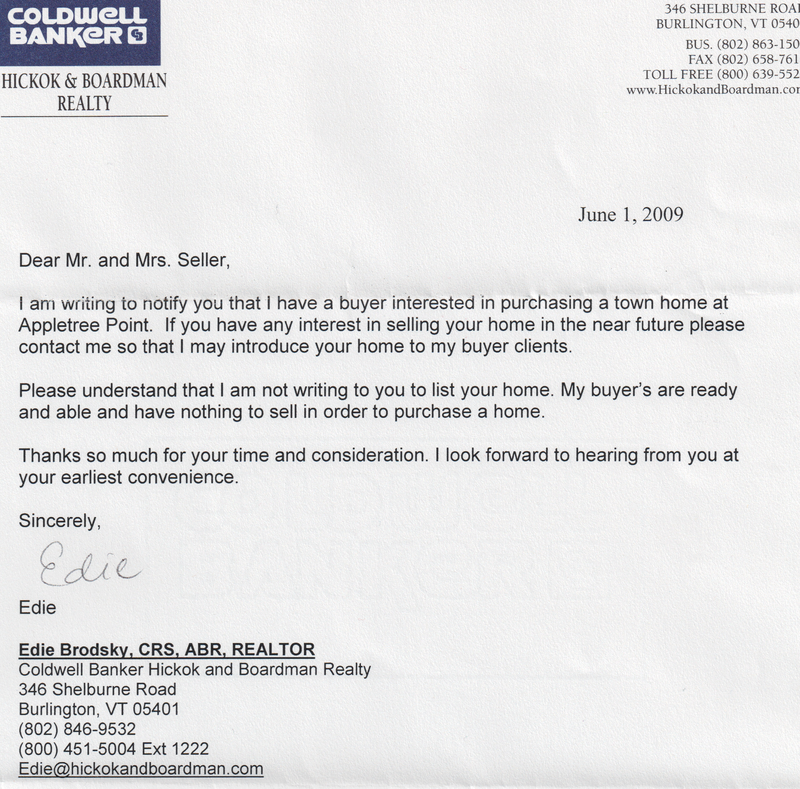 Then it asked if I was ready to sell my town house, because there was a buyer ready and waiting. “Only Genuine Pre-War American and British Whiskeys Served Here.” He starts to count how many lies are in those nine words, makes it to four, before he something interrupts him. That’s what this letter felt like. Someone treating me impersonally and wasting my time with something that had nothing to do with me. The realtor did sign the letter, though, as if her signature would show how much she cared. Compare it with what C.C Chapman and Todd Defren talked about this week. Find out who your audience is, find out what they care about and talk to them in a personal way. There are lots of things this realtor could have done to target her limited audience. She could have walked around three loops with fresh baked cookies and introduced herself. She could have targeted just the townhouse owners with some great advice on improving their houses to sell in a down market. Yes her client is the buyer, but Edie doesn’t make any money unless she brokers the deal. And to do that, she needs the owners. Instead she carpet-bombed innocent civilians in a lazy marketing campaign. Come on, Edie, you can do better next time. Others have done a great job in describing what actually happened at the Burlington Social Media Breakfast on June 1 that I thought I’d take a stab at describing what I took away from a community level. One of the reasons I wanted to put this event together was that even though Burlington is small, we’ve done a pretty poor job of pulling our digital and marketing people together. There are a few exceptions, but they feel very focused and limited, in some way. In Boston, for example, MITX (formerly MIMC) does a great job in giving people reasons to connect. I got involved with them in 1998 and stayed involved even after I moved to Vermont. Up here, though, every time someone pulled something together, it was more like “Breakfast and a Sales Pitch.” And because it’s so small here, everyone was worried about inviting competition, lest they try to steal a client. That’s my take, anyway, and I’ve been poking around this issue for the last 10 years. That’s what happened on Monday. That crowd was exactly who I had hoped would come. There were lots of PR, interactive and traditional agency people there, there were small entrepreneurial business people (we have lots of those in VT), there were people from non-profits (lots of them, too) and there were marketers from some of the biggest and best brands in VT (best brands in the U.S. for that matter). In short we all came because we wanted to know more about social media, we brought our openness and curiosity to the party, and we partook of something delicious with no strings attached. The energy of that event and the feedback I’ve received was overwhelming, from all different sorts of people. Some were just happy to meet old friends, others were happy to put faces to Twitter tags, and everyone felt that their marketing wheels were spinning. What happened on June 1 was a Social Event, even if it happened to have the label social media. That was the most exciting part, that’s exactly what C.C., and Todd talked about. Social Media. Public Relations. It happened in person, and during and after we passed what we experienced on through Twitter, blogs and more. It was a living, breathing example of what we were supposedly learning about.